Boytrapped - The Story of the Statens: Tierra Bella Century 2011 - What a Ride! Last spring I guided the scouts in my neighborhood on the rides for the Cycling Merit Badge for Boy Scouts. It’s something I really enjoy, so every couple of years I like to offer the service to the local boys. It was great. Liz joined me, Tyler was one of the scouts, and even Matt came along for all the rides, including the 50-miler, which I thought was amazing, at barely 9 years old and on a 20-inch bike (wheel size). Well, when it was over, I got back in to my groove commuting to work on my bike. It was great – I got road slicks so I could do it faster. Riding one way each day added about 20-30 minutes to my total commute time, but in that time I got a 45-55 minute workout, and it saved gas, of course. As days got colder, my rear wheel seized up – we had come up with a jerry-rigged solution to keep it alive as long as we had, so I guess I can’t complain, but it stopped my commuting until I could replace my wheels. I went back to sitting at a desk and getting fatter. During this time my sister and I started talking about century rides – 100-mile bike rides. She’s done several lately. I said it sounded like fun, and pretty soon we were talking about trying to find one that we could do together. I was a bit of a stickler and wouldn’t do one on a Sunday, and eventually I gave up on finding one. Not Vicky though – she found several that would work, and soon, she, my brother Paul, my Dad, and I were all talking about how fun it might be. I asked Liz and she could tell I really wanted to do it, so other than asking that I NOT do the ride on Mothers Day weekend, she said it was OK. I knew it would be an added strain on all of us for me to train and be gone for a few days, but on the other hand, I was gaining weight, and huffing and puffing after simply going up the stairs – I felt like I needed to have something to motivate me to eat right and exercise, because – let’s face it – I was not heading in a good direction. 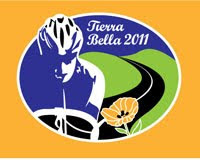 So we all registered for the April 16th 2011 Tierra Bella Century Ride. Now comes the procrastination…broken bike tire, cold, holidays, busy life, and a daily donut and doctor pepper…not good. I had found an 8-week training plan, so come February I knew it was time to get serious. I found a good deal on new wheels, bought a windbreaker jogging suit from Walmart, and resumed my commuting to work. It wasn’t pretty. I was tipping the scales at 212, when I should be at about 155-160, and I hadn’t been exercising for months. The first couple of rides took about 65 minutes each. After two weeks, I was down only to 55 minutes, and not feeling like I was making any improvement. I was eating right, but I wasn’t losing weight either. That’s when I decided it was time to cut out the caffeine-right away things got better - headaches went away, times started decreasing, and the weight started melting away. From this point on, training got a lot more fun. I tried to ride each way to work, when my schedule and the weather permitted it. I also tried to go on long rides on Fridays. I had a fun ride with my dad and brother, but noticed that, while on downhills and flats I did fine, on the uphill they pulled away from me and I was quickly into my lowest gear. I guess, when I have 50 extra pounds to bring up the hill, I shouldn’t be surprised. The next week I rode up North Ogden Pass. On the way down, with my front brakes not working quite right, my back brakes doing all the work, and having to slow down my extra weight on a 12.5% grade, it was just too much – my rim got super hot, my rim tape got stretchy, and my tube blew through the rim tape and in to the cavity in my double-walled rims. When I went to change the tire, the rim was so hot it burned my hand, and my tire was sticking to it. Patches wouldn’t hold, and I didn’t have a spare tube – it would have just blown again if I did. So I walked down - wife to the rescue! Thanks for the pickup, babe! Still, I was proud to have made it to the top. The next couple of weeks the weather was wet and cold, so I trained indoors for a while – very VERY boring. Still, if you watch a movie like Lord of the Rings, and ride harder in the action scenes, you get a good varied workout. Still, time was running out in a hurry and I still hadn’t done any rides longer than 22 miles. I was way short of my training goals – less than 50% completed – I was starting to stress, especially about the big hills. I mapped out a ride that would be close to the big climb – riding from Mountain Green to Snow Basin. I was very proud of myself to do the ride in just over an hour. OK so it turns out it was just a little more than half of the big climb, but it was a confidence booster. Then the weather turned bad and I got a stomach bug and had to scrap my plans for a big ride one week before the century date. Monday, however, I had nothing to do at work, and the weather was good, so I took the afternoon off and rode from Riverdale, along the paths out west, to the south end of the Legacy Parkway trail in North Salt Lake. On the way home I took a detour out further west to the Bluff Street trail. Total miles – 71. I was so tired, and very sore afterwards, but it had the desired results – one last big push to strengthen my legs and aerobic fitness, and it told me what I needed to know about pacing myself, and my abilities. Five days to century ride! At this point, I need to say thanks to Liz. She wasn’t thrilled about my ride plans – and who can blame her. With three boys in soccer all year, two in intermurals, scouts, cub scouts, and then our responsibilities in scouts and cub scouts, preschool, planning commission,woodwork business, pta presidency, school community council, and then the spring thaw with all the yardwork that entails, and of course the daily chores involved with being parents of five young children, and a myriad of other things that I’m not listing, now I want to add an hour a day to train, to be gone for three nights and almost four days for the ride, and of course, add to that the coveting of a sweet expensive road bike that I’m naturally going through while preparing to do a century ride on a 14-year old mountain bike to pile stress on top of trying to stretch our thin income to cover the needs and wants of a family of seven. Is it any wonder that she didn’t shout for joy when I told her I wanted to do the ride? The thing is, where it mattered, she really came through – picking me up from failed rides, surprising me with a maintenance package at the bike shop, and not complaining when I spent three times what I saved in gas on replacement parts for my bike. And of course, I know she was calling for my guardian angel to work overtime while I was out riding alone. And every time I started to think I couldn’t do it, or that I shouldn’t try, she gave me the encouragement I needed to stay on the wagon. Thanks, again, babe! You are awesome! I am seriously in your debt – even more than before, that is. Well, that gets us pretty much to the road trip. I could hardly sit still on Thursday at work. I went home a little early to have an hour of family time before I said goodbye – yummy Café Rio for dinner (best Mexican food ANYWHERE – yes, I’m obsessed, so sue me) and then Clerie arrived with my newest niece – nice to meet you Lucy! After saying goodbye, running in for other things, saying goodbye, running in for other things,…we did eventually get on the road.The coolest part about the road trip was figuring out the cool GPS stuff my new Droid can do – awesome phone. Otherwise, the drive can be summed up in one word: LONG. In Martinez, Vicky had a really tasty dinner in the works – grilled beef and chicken fajitas or tacos or whatever you want to call them. MMMMM. It was good to see my nephews again too – it’s been so long. I wish those guys lived closer! After dinner we went back to the hotel and did any last-minute tinkering on our bikes before going to sleep to be ready for the big ride. I was getting a bit jittery – not sure if I would be able to do it – the huge climb less than half-way through the ride, with a long way to go afterwards. 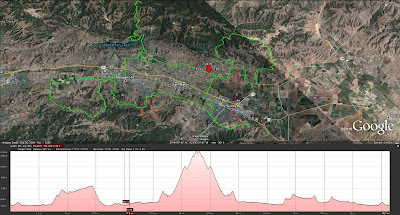 For the last few months, I’d been learning a lot about Google Earth – I learned how to do an elevation profile, so I prepared by mapping the route from last year’s ride, viewing the profiles – I admit, I was a bit obsessive about it. I knew what the terrain was like, and had figured out, based on my training, how fast I would be able to ride each part of the ride. I had, of course, put it into a spreadsheet, and had a plan for how fast to get to each waypoint. Yes, I’m an engineer, and I’m not ashamed! Morning came bright and early, we got loaded up and on our way. The weather was cool and humid, overcast, but not uncomfortable, especially compared to what I’d been training in. The start of the ride was very exciting – so many people all stoked to do this big ride. We got our wristbands, and got on our way. I have to say, I was so relieved that Vicky didn’t start out faster. She’s a biking machine, and I was quite worried about how things would go. She set a great pace. We passed some groups, others passed us, as we would our way up through the streets of Gilroy. I suspected pretty quickly that there had been some changes from the route I had seen. They didn’t seem substantial though. 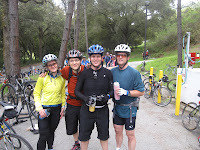 The weather was great, the organization of the ride was awesome, support was fun – it was a total party on bikes! We stayed more or less together for the first leg of the ride, except for Dad who, I think, overdid it, fearing he wouldn’t be able to keep up later or something. We got to the first big climb, a little behind schedule. I told Paul and Vicky not to wait for me, figuring we’d meet up at the rest stop at the springs. I was super slow on the hill. Eventually I caught up with my dad, who had slowed down, and we climbed together. He had heard the climb was much longer than it was. Fortunately, I knew we were just about to the top. It was so gorgeous though – green fields, green trees, wildflowers, rural California in the spring, and I felt great! We got to the rest stop with Paul and Vicky and had pictures, and then got on our way. My dad, again, took off too fast, but I pretty much stayed up with Paul and Vicky. The descent was cool. I took the first corner too fast and almost went off the road, and reminded myself to slow down. Then there was a dude in a skeleton outfit around the next bend, with a “slow down” sign, which also didn’t hurt as a reminder. From there on out, the descent was just awesome! Gorgeous views, winding turns, smooth road, and so much fun. I caught up with everyone, and then we rode as a group to the rest stop at 25 miles. I have to say, I really enjoyed riding as a group with my brother and sister (dad was still out ahead). I was looking forward to spending the whole ride with them. At the rest stop, I was feeling great! I think Paul and Vic were a little stressed because we were at least a half hour behind the ride plan, based on waypoints, that I had prepared. I told them not to wait for me on the climb, thinking I’d rejoin them at the top, or at least at the bottom, since I pwned the downhills. Looking forward to the rest of the ride and lovin’ it, I pulled my phone – my awesome new Droid 2 – out of my backpack to call Liz and to wish Isaac a happy soccer game, and it slipped out of my fingers and landed on a couple of pebbles – I saw the spiderweb cracks across the screen, and put it back into my bag without looking – determined NOT to feel sick about breaking a brand new $600 company phone…oops. I called Liz on another phone and said I’d call in a couple of hours – that we were about to start the big dreaded climb to Henry Coe State Park. Over the next 10 miles, I started to realize how substantial the changes were to the route – they amounted to throwing about 5-8 miles of riding through town into the first leg of the race before the first hill. By the time we got to the big hill, Paul and Vicky had gone on ahead and it was just me and my Dad, and he seemed spent. He had to get off and walk, and told me just to go on. I felt so guilty! I had pushed him, I felt, too hard to do the 100 mile ride with us instead of the 60-mile ride as had been his original plan, and now he was spent, having overdone it. I hoped he’d find a SAG vehicle or make his way to the 60-mile route that we had left several miles back. I proceeded to climb the hill. Being 30 pounds overweight, I was in my lowest gear on my mountain bike, and glad to have it. Weight doesn’t matter much on the flats, and maybe even helps on downhills a little, but on the uphills, it’s killer. People pay hundreds, even thousands of dollars to reduce the weight of their bike a few ounces. What does that say about the dollar value of my extra 30 pounds? I tell you what, I would have paid a lot, right then, not to have it with me. However, the low gears of my mountain bike saved my life. I wouldn’t have made it on a road bike – there’s just no way. So what if everybody left behind me seemed to pass me as I went up – I was still going up, and I didn’t have to stop. It was getting warmer now – I had shed a layer, and it was turning into such a gorgeous day. I passed a lake, rode across a really cool bridge, and then was back onto the mountain – narrow windy road, lots of switchbacks, when I saw my dad about ¼ mile behind me on the switchback below. I cheered him on and told him he was amazing. I was seriously impressed. As I kept climbing, I kept thinking I would be at the top any time – my route plan had the top at about 42 miles, and soon I was up to 48 miles on my bike computer, and still no top. Every time I’d think I was there, I’d round a corner and see that the mountain still went up and up. Eventually I got to a bunch of stopped riders. Apparently one of the first people to turn around at the top had gone too fast – ambulances needed to get by, so we had to stop for about 15 minutes. I kept looking back to see if my dad had caught up, and there was no sign of him. I hoped he was OK. I was hoping, at this point, to get up to the top before Paul and Vicky left, because I knew I would need to draft behind someone when we got back down – there was about 10-15 miles heading north, into what by now was a fairly stiff north wind. Well, after the ambulance passed, I got on my way again, and everyone who had stopped behind me seemed to pass me. Then we got to a sign that said “steep hill”, and I thought “what do you call what I’ve been riding on? Can it be that much worse?” It was. I thought I was going to die. But I kept going. A lady’s chain broke as she was pedaling right in front of me, and again I was grateful for my low gears. Right about this time Paul and Vicky passed me. Then five minutes later I got to the top. Their food wasn’t impressive for me and my allergies, so I refilled my fluids, crammed down some granola bars, used the facilities, and got on my way, hoping I would see them at the bottom. Then, as I pulled out of the park headquarters, there came my dad. I told him he was awesome, but I guess he didn’t hear me – Paul had said something to him about me being up ahead of him as he passed Dad on the way down, and Dad thought I was waiting for him at the top. I wish now that I had – Sorry, Dad – as I never did catch up with Paul and Vicky. The ride down was nothing short of amazing, exhilarating, and fantastically beautiful! Trees and flowers and fields and lakes and superelevated curves, with very few cars or bikes by this point – I was not anywhere near the head of the race, though I did pass a few on the way down. It was the sweetest road descent I’ve ever had. So, SO cool. Then, as I expected, was a 20-mph headwind for the next 15 miles. After about 5 miles I was really tired, when I pulled up at a stoplight and heard the clicking of road bikes (compared to my silent-coasting bike) coasting to a stop behind me. They passed me after we went around the corner, but they were going just the right speed that, as I caught up to them, I could draft behind them – a pace line, as more experienced cyclists call it. I was saved! A few miles down the road, a woman in the back of the pace line (on a very nice bike, btw) fell back, and that was perfect because I was falling back too. Then a couple more miles and she had to stop for a break, just as another pace-line came up for me to tag along with. Finally we turned west, and I pulled ahead and was doing GREAT! Until at 70 miles and out of fluids, a piece of glass blew my tire and I had to stop and patch it. GRRR…I cut a patch of old tube and patched the inside of the tire, got a hefty patch and patched the rather large hole in my tube, and then used the CO2 inflator my Dad had given me – Thanks, Dad. Again, I felt guilty, hoping that he hadn’t gotten lost by the wayside in all that grueling headwind. So after a 15-minute rest to patch my tire, (and out of fluids by this time), I got back on my way. There were some hills – not small, but nowhere near the scale of the first two climbs, and then I pulled into the rest stop at the 75-mile point. I was feeling so stressed by now because, not having met up with my dad, brother, or sister, I wasn’t able to call my wife from the top of the mountain like I had promised her – the people I asked didn’t have phones. Here, though, I kept asking till I found one. It was now about 2:30. I had 25 miles to go (or so I thought) – I figured it was like riding to work and back, plus a few hills. I was tired, but I just might make it back in time - my goal all along had been to make it back before the 5:00 deadline at which point dinner was to stop being served, and SAG vehicles were to round up any stragglers. I had now made it up the big climb, and across the flats with the headwind, and though there were some hills, it was overall a downhill grade with a headwind at my back. I got on my way again – enjoying the beautiful lakes, farms, small towns, and hills – I even saw a wild turkey. By now people were mostly spread out and I was alone for long stretches of the ride at a time. The solitude was so peaceful, and the ride so pristine. It was so cool. The hills still slowed me down a lot, but I had more energy than I had expected to for the flats, and of course, the downhill stretches were SWEET! I skipped the last rest stop, cut off the fingers on my gloves to relieve my sweaty hands, and then I realized that the last detour to the west and back to the east had been clipped off the ride in favor of the added length at the start, and was encouraged when I topped the last big hill. Back into Gilroy I was cruising – southbound at 20-25 mph with a 20-mph tailwind. I crested the last uphill and my computer marked 100.0 miles. I only had 10 minutes left and no idea how much longer the ride was. I picked it up, and as I pulled in to Gavilan college, I took in a deep breath to let out a cheer, and then I saw my Dad’s car, and he wasn’t there, and the cheer kind of fizzled out as I worried about how he had done and where he was. Still, I pulled up to the student center as the clock chimed 5:00. I had made it. I found Paul and Vicky, grabbed some food, and triumphantly sat down and worried about Dad with them, till he called about 10 minutes later – he stopped at his car, but he had made it too. Way to go, Dad!!! It was quite the feeling of accomplishment! We had all made it. I wished that we had stuck together because it was more fun when we were together at the start of the race, but other than that, it was really an awesome, amazing day. The whole experience – training for it, and then doing it, was something life changing for me. I had started out at 212 lbs and climbing, in terrible shape, and feeling old – I couldn’t move without seeming making some sort of sighing or moaning sound, and I was out of breath after climbing the stairs. Training really could have been an end in and of itself, losing 18 pounds, feeling 10 years younger, and being able to jump, run, bike, without feeling short of breath. It really increased my quality of life. Then to add the ride day – the excitement, the party atmosphere, the extremely challenging climb, then the discouraging headwind, and to come out on top – it’s really hard to describe the sense of achievement and satisfaction that came from it. I have got to do it again, and again, and again! And I want so badly to share the experience with my wife, and with my kids as they get old enough. I’m trying to temper my enthusiasm and get back to normal life for a while and catch up on all that I got behind on, and believe me there is a lot. With four soccer games a week, and once baseball season starts up, eight baseball games a week, preparation for the Farmers Market, filling several huge woodwork orders, making more wands for the Deathly Hallows part 2 opening, working full time, homework, yardwork,…I’m afraid my life just can’t be centered on cycling, but I hope it will remain an important part of my life. Thanks to my brother, sister, and dad – it was so much fun. Most of all, thanks to my kids, and my wife, for their sacrifices while I trained and was gone from them. It was work for me to train, but it was much more work for Liz to pull extra duty while I trained. In the end, it was so worth it for me. I hope someday to return the favor. I think Vicky had a good idea what pace to keep the entire time. I thought that we were behind, judging from your time sheet, not noticing the detours you'd caught up on. Vicky was an awesome riding partner. In that brutal headwind stretch, she waited for me several times. I felt bad, but she said she enjoyed having a riding partner. I liked how your story started with the training. I gave a dry synopsis of the race from my point of view, but yours was the better story! By the way, way to go on the ride! Hahaha, Don called it the "War and Peace" version - I guess I get a bit long-winded sometimes. But hey, I wrote it for me for a journal entry, and not to win any blogger awards.